Persistence Market Research presents a comprehensive report titled ‘Surgical Blades Market: Global Industry Analysis 2012-2016 and Forecast 2017-2026’. This report tracks the global surgical blades market and gives the forecast for this market for a period of nine years. As the growth in the global surgical blades market is dependent on the growth in the number of surgeries worldwide, this market is likely to exhibit a good growth potential. The number of surgeries being performed in the world is growing due to improved access of healthcare, increasing burden of diseases and increasing geriatric population, which is leading to the growth in the global surgical blades market. In order to understand the global surgical blades market in a better manner, the report is divided into four distinct parts. The first part of the report comprises the introduction section with the executive summary of the report. This part also contains the market taxonomy and the definition of the product along with the market viewpoint. The second part of the report features the global surgical blades market size and forecast by product type, end user and material type. This part of the report contains the important market numbers in the form of revenue comparison, market share comparison and year-on-year growth comparison. The third section of the report comprises the regional assessment of the global surgical blades market and the regions are chosen as per the market taxonomy. The last part of the report comprises the competition landscape of the global surgical blades market and includes information on the key players operating in this market. The competition landscape contains detailed information on the important companies operating in the global surgical blades market such as company description, product overview, key developments, strategic overview and key financials of each of the featured companies along with the SWOT analysis of the company. This competition landscape is a valuable part of the report as it contains all the necessary information to study the leading companies operating in the global surgical blades market in detail and also reveals how they implement their strategies and vision to stay at the top in this highly competitive market. Overall market size has been analyzed through historical data, primary responses, and public domain data. Revenue of companies in the surgical blades market has been benchmarked to ascertain the market size for the base year. Macroeconomic indicators such as GDP and industry growth have been considered to forecast the market size over the forecast period. The historical growth trend of end-use industries, market participants’ performance, as well as the present macro-economic outlook has been taken into consideration for estimating the overall market trend forecast. This data is then validated using the triangulation method and is extensively scrutinized using advanced tools to garner quantitative and qualitative insights into the global surgical blades market. The market taxonomy of the global surgical blades market is presented to give a holistic picture about this market and ensure that all the segments and sub-segments of this market are properly represented. This market taxonomy also helps the report readers in getting the full extent of the global surgical blades market and helps in the logical interpretation of the market numbers presented in this report. As the market for surgical blades is volume driven, an increasing number of surgeries is likely to benefit market revenue growth, owing to the increased demand for surgical blades. In addition, a growing geriatric population around the world will also benefit the market positively. Moreover, the rising number of medical centers of excellence with comparatively higher number of operating rooms and employing different kinds of surgeons with multiple specialties is also expected to have a positive impact on the surgical blades market. Besides these factors, the products that are used in surgical procedures are classified as low risk devices that don’t need to go through a stringent regulatory process. This also acts as a boosting factor for new product launches and subsequently the revenue growth of surgical blades. In order to explore the global surgical blades market in a thorough manner, Persistence Market Research has delivered a new and a detailed report with important information regarding this market and explores all the aspects of this market comprehensively so as to deliver a report that is full of actionable insights. The global surgical blades market is structured in a lucid style that incorporates all the important regional markets spread throughout the world and provides information on all the regional markets in a singular entity in the form of this global report on surgical blades. The report on the global surgical blades market contains a historical analysis of this market for the time period 2012 to 2016. In addition, the projections for the global surgical blades market have been made for a time period of nine years and start from the year 2017 and end in the year 2026. As per the assessment made by Persistence Market Research, the global surgical blades market is slated to display a sluggish CAGR. 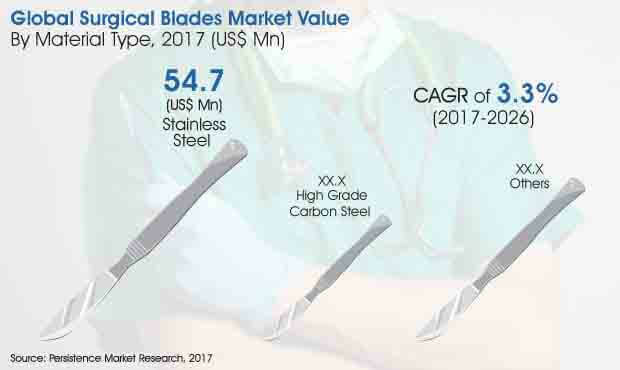 As per the projections presented in the report, the global surgical blades market was estimated to be valued at US$ 130 Mn by 2017 end and is poised to reach a valuation of nearly US$ 180 Mn by the end of the year 2026. The stainless steel sub-segment in the material type category of the global surgical blades market is predicted to exhibit a CAGR of 3.2% during the period of assessment. The stainless steel sub-segment is the most attractive in the material type category. As per the report projections, the stainless steel segment was estimated to be valued at nearly US$ 55 Mn in 2017 and is likely to reach a value of nearly US$ 73 Mn by the end of the assessment period in 2026. The high grade carbon steel sub-segment is the least attractive by value in the material type category, and is likely to exhibit a CAGR of 4.0% during the period of assessment. The high grade carbon steel sub-segment was estimated to be valued at nearly US$ 33 Mn in 2017 and is likely to reach a market value of nearly US$ 47 Mn at the end of the year 2026. Persistence Market Research has included a number of important companies functioning in the global surgical blades market in the competition landscape section of this report. Some of the key players that have been profiled in this report include Swann-Morton Limited, Hill-Rom, PL Medical Co., LLC., VOGT Medical, Hu-Friedy Mfg. Co., LLC, B. Braun Melsungen AG, Kai Industries Co., Ltd., Beaver-Visitec International, MYCO Medical, Inc., Medicom, Huaiyin Medical Instruments Co.,Ltd, Cincinnati Surgical Company Inc., SouthMedic, Surgical Specialties Corporation and Havel's Inc.